The world famous Meenakshi temple is located in Madurai. This temple is dedicated to the Lord Shiva and Meenakshi. The Meenakshi temple complex is one of the largest and one of the most ancient city temple. 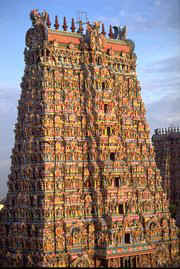 The city of Madurai, was originally built around the Meenakshi temple. The rectangular streets named after the Tamil months surround the temple, symbolizing the structure of the cosmos. The architecture of the Meenakshi temple is splendour and outdoes all the temples. The Temple Complex in itself is breathtaking. The fort-like walls are pierced with lofty gopurams or towers, over an area of 640,000 square feet. The gopurams are adorned with figures of Hindu Gods, animals and mythological creatures. Upon entering temple, one gets to view the spectacular "Potraamaraikkulam", meaning the Golden Lotus Pond, surrounded by corridors depicting mural from the "Thiruvilaiyaadal Puraanam". The "Ayirangaal Mandapam" (Thousand Pillared Hall) is another exhibit of impressive craftsmanship whose pillars feature sculptural work beyond comparison. The Origin Of The Meenakshi Temple and the Sri Meenakshi Sundareswara temple and Madurai city originated together. According to legends, once upon a time Lord Indra committed sin when he killed a demon, who was then performing penance.He could find no relief from remorse in his own kingdom so he came down to earth. While passing through a forest of Kadamba trees in Pandya land, he felt relieved of his burden. The people told him that there is a shivalinga under a Kadamba tree and beside a lake and by woshipping it you could be relieved of your burden. He worshipped that Linga and built a small temple around it. It is believed that it is this Linga, which is still worshipped in the Madurai temple. The shrine is called the "Indra Vimana". Once Dhananjaya, a merchant of Manavur, where the Pandyas had arrived after the second deluge in Kumari Kandam, having been overtaken by nightfall in Kadamba forest, spent the night in the Indra Vimana. When next morning he woke up, he was surprised to see signs of worship. From the banks of the lovely and historic Golden Lily tank the most popular photographic views of the temple are taken, that shows the gigantic south outer Gopura. The northern corridor leads directly to the shrine of the goddess. On its pillars are the images of some of the Sangam poets, of Kulasekhara Pandya, the first builder of the temple, and of Dhananjaya, who figures in the traditional story of its origin. The corridors around the tank are rightly called the "Chitra Mandapa", as the walls carry paintings of the divine sports of the Lord, as narrated in the "Tiruvilayadal Puranam". The paintings are renewed from time to time. Earlier some paintings were affixed on the wooden panels over an older series. These paintings were then removed to the Temple Museum in the thousand-pillared Mandapa, leaving some dilapidated murals to view. It is impossible to ascertain the date of these. It was in the sixteenth century that the corridors and the steps leading down to the tank were constructed. The northern corridor and steps were constructed in 1562, those on the east in 1573, and those on the south five years later. These two mandapas stand on the farther way to the shrine of the Goddess. On their ceilings are more paintings. A celebrated mural, opposite to the entrance of the shrine, depicts the marriage of Goddess Meenakshi. The Kilikatti Mandapa derives its name from the fact that there are parrots in a cage here. On its walls are carvings of the divine sports. This mandapa is the most ornamental mandapa of temple, built in 1623. 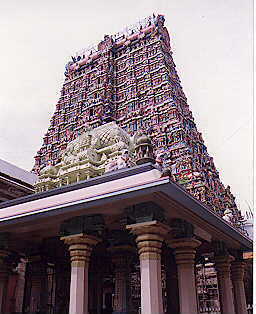 The temple of Goddess Meenakshi consists of a square sanctum, an Ardhamandapa and a Mukhamandapa. In the niches on the walls of the shrine are images of Iccasakthi in the south, Kriyasakthi in the west, and Jnanasakthi in the north. There are shrines of Vinayaka and Subramanya in the outer Prakara. They probably belong to the fifteenth century. There are a number of historic shrines in the Prakaras. Opposite to an entrance into the first from the Mahamandapa there is one of Lord Sabhapathi. This is the famous Velliambalam where one of the Lord's divine sports took place when, at the request of the sages, Patanjali and Vyagrapadha, he danced as Lord Nataraja. The enormous temple complex is dedicated to Shiva, known here as Sundareshvara and his consort Parvati or Meenakshi. The original temple was built by Kulasekara Pandya, but the entire credit for making the temple as splendid as it is today goes to the Nayaks. The Nayaks ruled Madurai from 16th to 18th century and left a majestic imprint of their rule in the Meenakshi - Sundareswarar Temple. The temple complex is within a high-walled enclosure, at the core of which are the two sanctums for meenakshi and Sundareshwara, surrounded by a number of smaller shrines and grand pillared halls. Especially impressive are the 12 gopuras. It is a tradition in this temple that the devotees must first worship to the Goddess Meenakshi. Therefore, while there are four other entrances into the temple, under huge Gopuras in the four cardinal directions, but it is customary to not to enter through any of them but through a Mandapa, with no tower above it. This entrance leads directly to the shrine of the Goddess. Ashta Sakthi Mandapa is an impressive structure, with a hemispherical ceiling. It is 14m long and 5.5m wide. There are bas-reliefs all over the place. Over the entrance one of them depicts the marriage of Goddess Meenakshi with Lord Somasundara. The Mandapa derives its name, the "Ashta Sakthi", from the fact it contains sculptures of the eight Sakthis (also spelt as Shakti). Those of the four principal Nyanmars were added during renovation of the temple in 1960-63. The Mudali Pillai Mandapa follows the Chitra Gopura. This mandapa was added in 1613, and is 183m long and 7.6m wide. On its wall are many puranic scenes. In this mandapa there was no light, and windows were also added in the last renovation. The Thousand Pillar Mandapa is the 'wonder of the palace'. But actually there are 985 beautifully decorated pillars. Each pillar is sculptured and is a monument of the Dravidian sculpture. There is a temple art museum in this 1000 pillars hall where you can see icons, photographs, drawings, etc., exhibiting the 1200 years old history. There are so many other smaller and bigger mandapams in the temple. Just outside this mandapam, towards the west, are the Musical Pillars. Each pillar when stuck, produces a different musical note. This mandapam was built by Thirumalai Nayakkar. Vasanthosavam, the Spring festival is celebrated in this mandapam in Vaikasi (April/May). Its pillars contain elaborate sculptures of Shiva, Meenakshi, scenes from their wedding as well as the figures of ten of the Nayak Kings and their consorts. This is also called Pudhu Mandapam. The majestic palace was built by Thirumalai Nayak in 1636, about 1.5 kms south – east of Meenakshi temple. Today, only a quarter of the original palace has remained, but it still reflects the grandeur of the bygone era. Swargavilasa (Heavenly Pavilion), a marvel of Indo-Saracenic architectural style has a rectangular courtyard measuring 75 mts. x 52 mts. and is constructed entirely of brick and mortar without the support of a single rafter or girder. It is flanked by 18 mts. tall colonnade connected by beautifully decorated high arches. Daily sound and light shows in English at 1845 hrs. and in Tamil at 2015 hrs are held here. The show relates to the story of Tamil epic, Shilipaddikaram and the history of Nayaks, with special emphasis on King Thirumalai. The palace Museum in the adjacent hall exhibits Pandyan, Jain and Buddhist sculptures and terracotas. The Lord Azhagar temple here is said to be the site where Lord Vishnu came down from heaven to give away Meenakshi in marriage to Sunareswarar. The Chitrai festival of the Meenakashi temple celebrates this journey. Pazhamudhirsolai, one of the six sacred abodes of Lord Subramanya is also on the same hill, about 4 kms. from Azhagarkoil. The rock cut temple is regarded as one of the six sacred abodes of Lord Subramanaya. According to legends, Lord Subramanaya married the daughter of Lord Indra here. The main temple festival held in March – April celebrates the marriage anniversary of Lord Subramanya and attracts a large number of devotees. It is a major road and rail junction of the region. Dindigul is dotted with ancient shrines and is about 100 kms. from Kodaikanal, the famous hill resort. The 200 years old temple at the hill top fort (Kottai) enshrines the Mariamman idol, which is said to be installed by a soldier of Tipu Sultan. There are also shrines of Vetri Vinayaka and Lord Muruga. The ancient temple came into prominence during the period of Thirumalai Naicker, who renovated several temples in and around Madurai. The shrines is dedicated to Lord Kaalkatheeswarar and goddess Gnanambika. The festival of Brahmasaram in the month of Chitrai is the main event celebrated here. It is 37 kms. From Sivaganga and 12 kms. from Karaikudi. The beautiful cave temple over here is a fine example of Pallava architecture. The massive statue of Vinayaka or Pillaiyar is one of the best in the country. The historic town 21 kms. from Pudukkotai is famous for its fort built in 1687, by Vijaya Ragunatha Thevar, the Sethupathi of Ramanathapuram. There are also two rock-cut cave temples dedicated to Siva as Satyagiriswarar and Vishnu as Satyamurti. Karaikudi, the home of Chettiars, known for their business acumen, prosperity and hospitality is 45 kms. from Shivaganga, on the Tiruchchirapali – Rameswaram high Road. The small town is studded with palatial bungalow’s noted for beautifully carved woodwork, as well as the stone and mortar work. It is also famous for Sri Meenakshi – Sundareswarar temple or Sivan temple built during 1872. the temple has 108 statues of Lord Ganapati. The beautiful dam site amidst lush hills lies on the way to Periyar sanctuary. There is a well laid out garden here. Britishers started the construction of the church in 1866 and was completed in 1872. It is the church of the Dindigul district.